A performance of the central act of Harrison Birtwistle's opera The Mask of Orpheus by the BBC Symphony Orchestra and the BBC Singers, conducted by Martyn Brabbins. 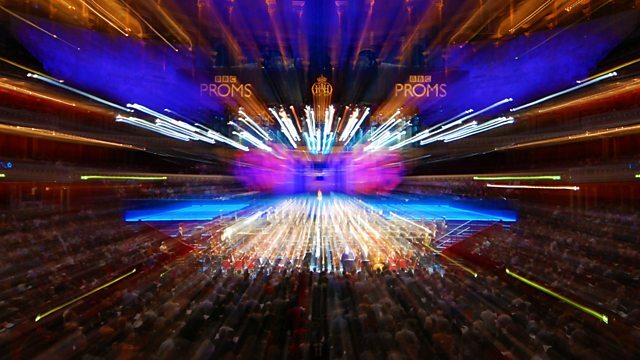 Charles Hazlewood presents as the Proms mark the 75th birthday of one of Britain's greatest living composers, Sir Harrison Birtwistle, with a rare performance of the central act of his monumental opera The Mask of Orpheus. It is performed by the BBC Symphony Orchestra, the BBC Singers and a cast that includes Alan Oke and Christine Rice, and conducted by Martyn Brabbins with Ryan Wigglesworth. Brabbins opens the concert with Popcorn Superhet Receiver by Radiohead's Jonny Greenwood, a piece which won the Radio 3 Listeners' Award at the 2006 British Composer Awards. Stravinsky's elegant ballet music Apollo contrasts these two contemporary works.